The following is a Gilby rememberance from former Snohomish High cross country coach Dan Parker, currently the XC coach at Glacier Peak High. A 1970 SHS grad and three-year track/cross country letterman under coach Larry Eason, Parker coached the Panther girls XC teams to four state team titles in 1995, 1996, 2002 and 2003 before moving to Glacier Peak when it opened in 2008 and adding a fifth XC state title in 2010 while coaching the GPHS girls . In 1994, Parker wrote the nomination that led to Keith Gilbertson Sr. becoming a charter member of the Washington Cross County Coaches Hall of Fame. He was always COACH to me. Even after I was 50, I couldn’t bring myself to refer to him as anything other than Coach. His first name WAS Coach. And he was one of the few people that called me Danny. It is like we were frozen in time: he forever the coach and me always the student-athlete. In reality, he never did stop teaching me. I remember the first time I saw Coach Gilbertson, handing out those old cotton red sweats to his athletes in a stuffy drying closet in the back of the old B building locker room at SHS, air permeated with the smell of Atomic Balm, the grandfather of Ben-Gay and Icy Hot. He wasn’t a big man – runners like Cliff Hurn towered over him – yet his presence filled the room, and there was never any question as to who was running the show.Jim Freeman, a superb distance runner and marathoner in the ’60s and ’70s, taught math at the old Snohomish Junior High. He took it upon himself to informally coach (no actual junior high XC teams at that time or seventh-grade football) those boys at SJHS who showed the greatest promise in long distance running, based on how they ran in P.E. Among those lucky few were Ken Hoerath, Chuck Swoboda, Paul Moon and myself, all seventh-graders in the fall of 1964. Freeman would train us after school on the expansive bog at the junior high or run us up to the high school to train on that hallowed ground. We stood or ran in awe of the “older” boys and, in particular, their seemingly gruff coach, Coach Gilbertson. His runners’ respect for him, even in my early brief observations, was obvious. As I studied their interaction I began to dwell on the thought that I, too, would enjoy the privilege of being coached by this man to whom I refer to as the Father of Washington State Cross Country. Never happened. We seventh-graders were allowed to run as non-scorers in the high school races that season. It gave us an immense feeling of accomplishment and satisfaction when we would pass a high school runner from Snohomish or any other team. At the end of the race Coach Freeman would ask us about our race and point out what we had done well and, of course, not so well, and we would listen attentively. Those few well-placed words he spent on us . . . made us feel like somebody, and made us even more determined to make the effort to really be SOMEBODY! But then Coach Gilbertson would stop and weigh in with words of encouragement, and we would revel in that attention. I mean, he was the HIGH SCHOOL coach! What did he care about us wimpy little seventh-graders? Well, those few well-placed words he spent on us were etched in our memories. They made us feel like somebody, and made us even more determined to make the effort to really be SOMEBODY! At that time I looked forward to four years of running cross country and track under the guidance of Coach Gilb. 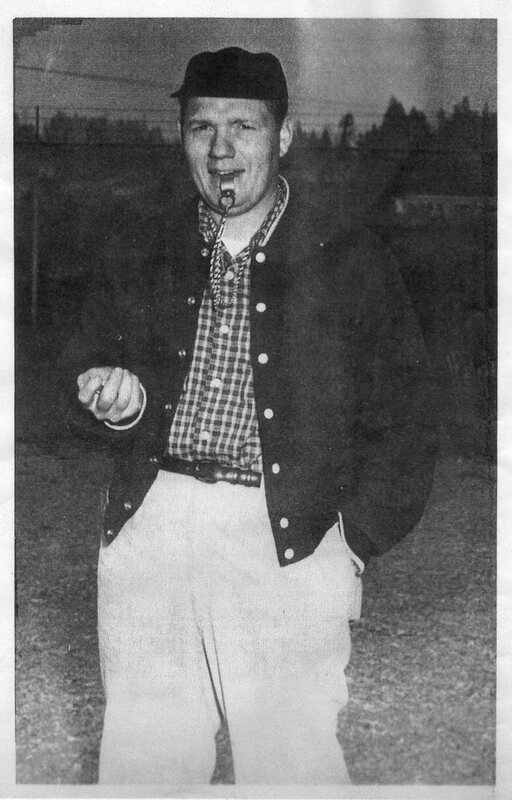 But in 1966 he signed on to coach the fall sport he first loved, football, as an assistant to Coach Armstrong. The football program’s gain was cross country’s loss but Coach Gilbertson had left his mark on my sport. In the mid-1950s Coach Gilbertson was unwillingly separated from his coaching position in football at SHS for doing the unthinkable – holding high school athletes accountable for their actions and, as a result, losing, seemingly unforgivable offenses at the time. But Coach Gilb could never NOT coach. Instead he embraced a new fall sport in its infancy, cross country, and “the rest is history.” I’m not sure how much he knew about the sport or about coaching the sport, but no one, it seems, was a quicker study. According to “The History of Washington State Cross Country,” which ranked the best boys teams in the state decade by decade, Snohomish High School dominated the sport from 1959-69 (1959 being the first year of a cross country “state meet”). Coach Gilbertson was the guiding force in the first seven years and in that time span his teams won two state championships and ran second in three state meets. The other two state meets saw the Panthers place fifth – obviously “down” years. A second state championship was not a bad way for the Coach to ease out of the sport. In the early years his teams were competing against schools with student populations much larger than that of Snohomish; there were no divisions until 1962. His teams were always competing against many more teams than we compete against at state today – 16. And compete they did! Coach Gilbertson had the ability to bring out the utmost from a collection of individuals with seemingly no inherent athletic ability. Those runners had some things in common: a willingness to push themselves to places of pain where most fear to go, and an unwavering trust in a unique man who asked them to go there. Coach Gilbertson had the ability to bring out the utmost from a collection of individuals with seemingly no inherent athletic ability. Those runners had some things in common: a willingness to push themselves to places of pain where most fear to go, and an unwavering trust in a unique man who asked them to go there. Those runners are unknown to most of you, but they were the heroes of my youth: Ron Stjern, Walt Hoerath, Terry Phillips, Tom Gilpin, Lyman Pease, Mike Evans, Wayne and Al Bartelheimer, Buzz Schilaty, Jim Sanders, Steve Linse. They were the stars, names as easy to remember, for me, as their races and running styles were. And that brings to mind another of Coach Gilbertson’s amazing gifts: the ability to remember the name of every athlete that ever had the good fortune to call him Coach, no matter how insignificant their contribution to the team might have been. As a teacher who has trouble remembering students’ names from one year to the next, I’ve always been blown away by that ability of his. Sometime around 2005, we found an old track jersey (Coach Gilbertson was also a legend as a track coach) from the late ’50s, tucked away in the recesses of the locker room. It had discolored from white to cream, a red “S” with wings was embroidered on the front, and someone had printed a red “1” on the back. I thought Coach would get a kick out of the artifact so I showed it to him. After looking at it, nearly 60 years after it was last worn by the athlete, Coach Gilb matter-of-factly said, “Oh yeah, that is Joe Miller’s track jersey …” I’m sure he also mentioned the year, the events Miller competed in and his exact times and distances. The problem is I CAN’T remember. For photos of Keith Gilbertson Sr.’s state-championship cross country teams, click here. To join the effort to endow an annual SHS scholarship in Coach Gilbertson’s honor, click here.